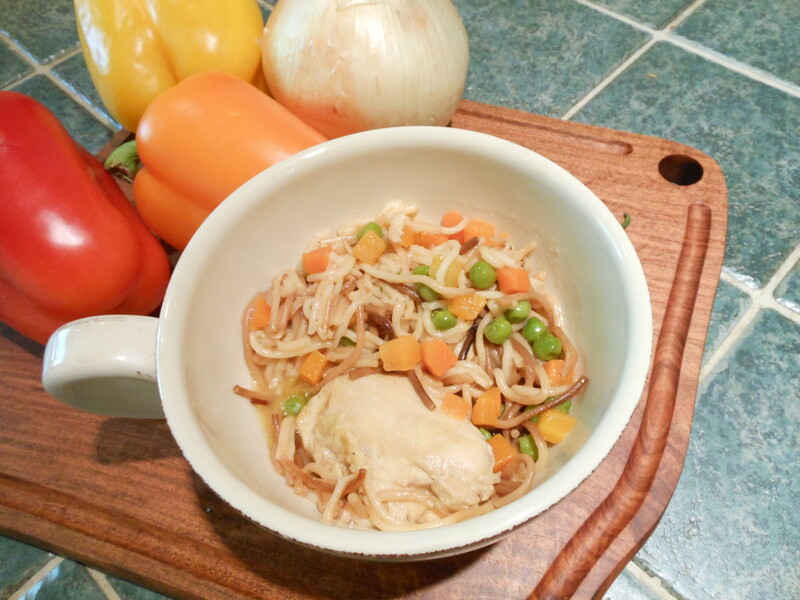 Fideo con pollo is a hearty dish that will warm your family for years to come. 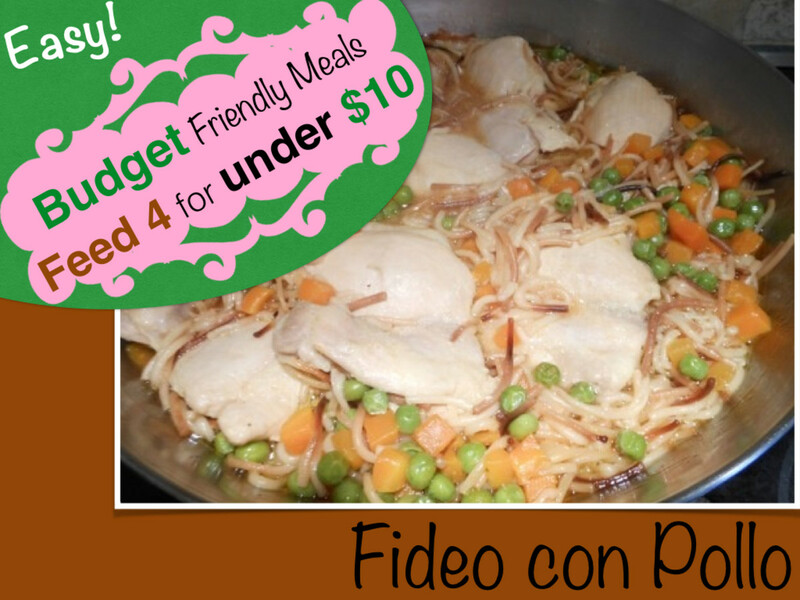 Fideo con pollo is perfect for lunch or dinner and can easily serve a family of 4 - 6 for under $10. 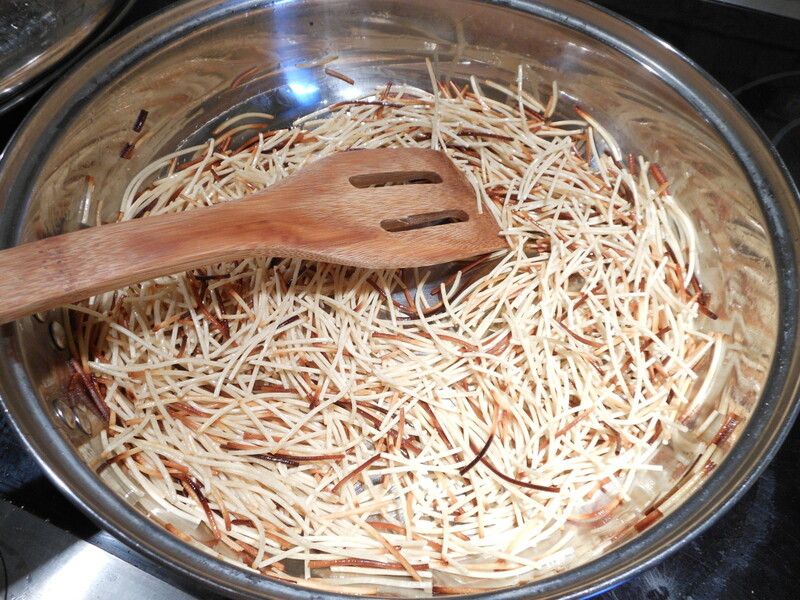 Fideo is a common staple in many Mexican kitchens. 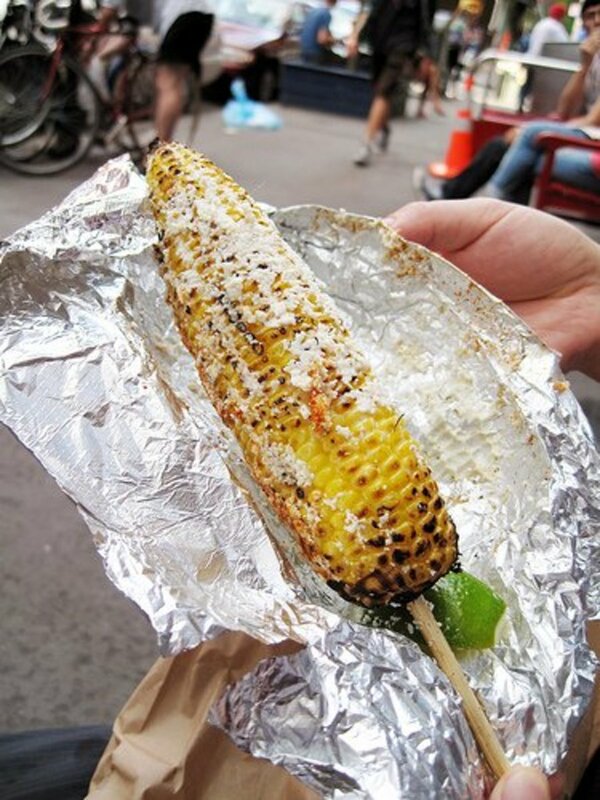 It can be prepared alone, with vegetables, beef, or chicken. It is usually stir fried with a small amount of oil to a golden brown and then immersed in liquids such as, broths, sauces or flavored bouillon. The fideo soaks up the liquid and becomes a plump pasta. Over the years, I have tasted many versions of fideo. I've never seen it made exactly the same way in the each of the homes I have visited. Some dishes are soupy, while others are dry. Preparation is unique to the preparer and can be customized to the tastes of the family. I've never had a variation that I didn't like. Yields: 4 - 6 hearty servings. Knorr: caldo de tomate - substitute. If you are unable to locate Knorr Tomato Boullion, you may use a homemade or store bought chicken broth of your choice. Consider adding tomato and a bit of garlic and cumin for flavor. Add 1 tablespoon canola oil to a medium skillet and set to medium heat. 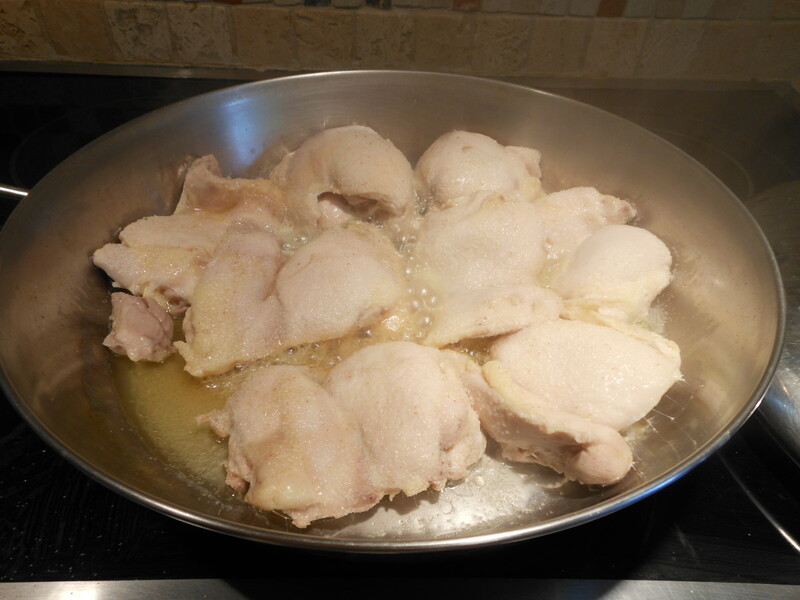 Add chicken thighs and spread evenly in the skillet. Add a dash of garlic powder to the chicken. Cover the chicken and allow to simmer for about 15 minutes. Add 1 tablespoon canola oil to a medium skillet and set the heat to medium. Add the fideo (vermicelli) and stir fry until golden brown. 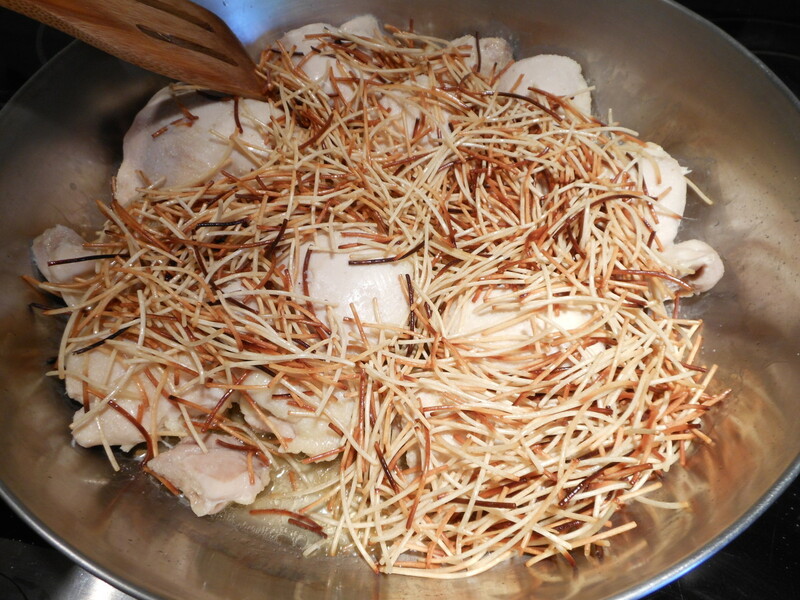 Once the chicken is cooked remove the cover and add the browned fideo over the chicken. 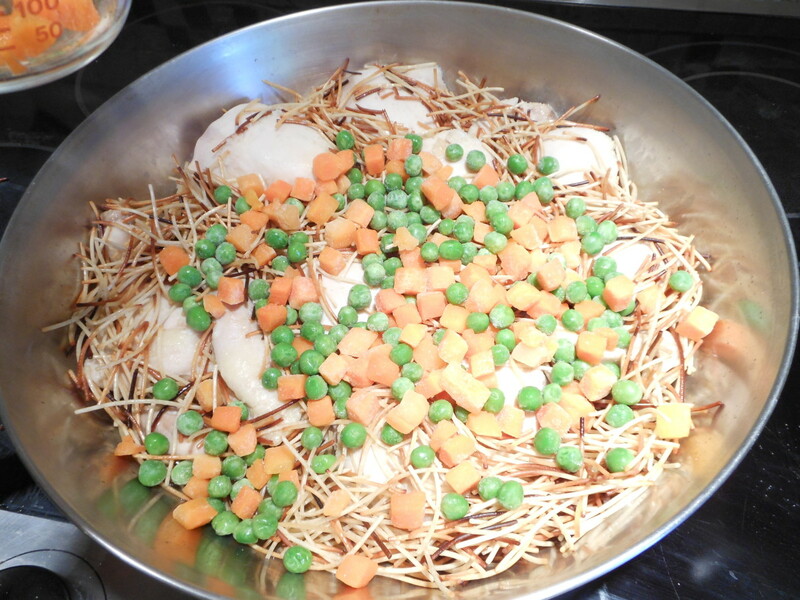 Add one cup of frozen peas and carrots over the fideo. Add 1 tablespoon tomato bouillon to 2 cups of water. Bring to a boil in the microwave or in a saucepan. 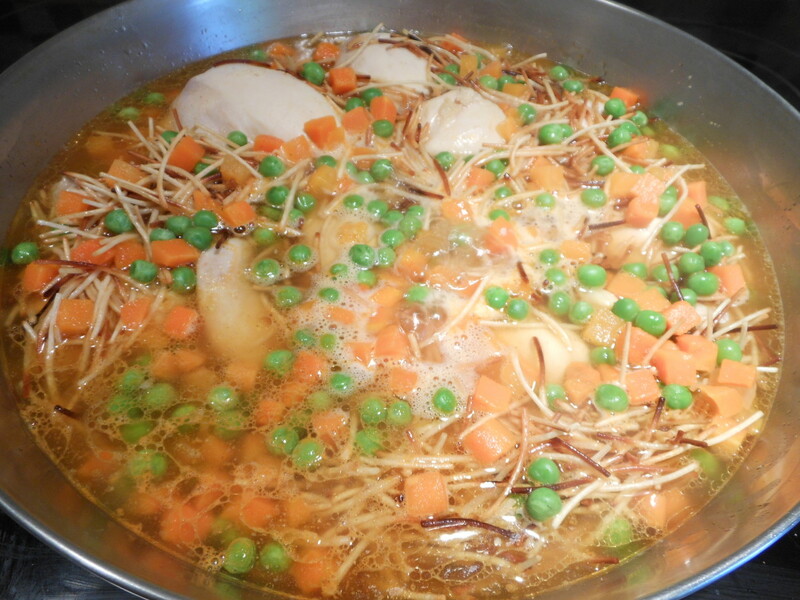 Pour the boiling bouillon over the fideo and chicken mixture. Raise the heat to medium/high and bring the whole mixture to a boil. Cover and reduce the heat to low. 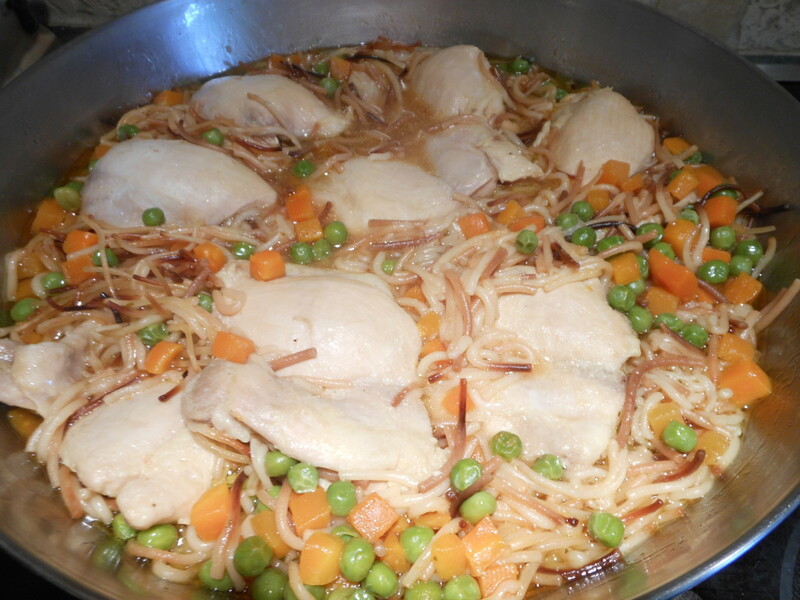 Allow the fideo and chicken mixture 10 minutes to simmer and absorb the broth. 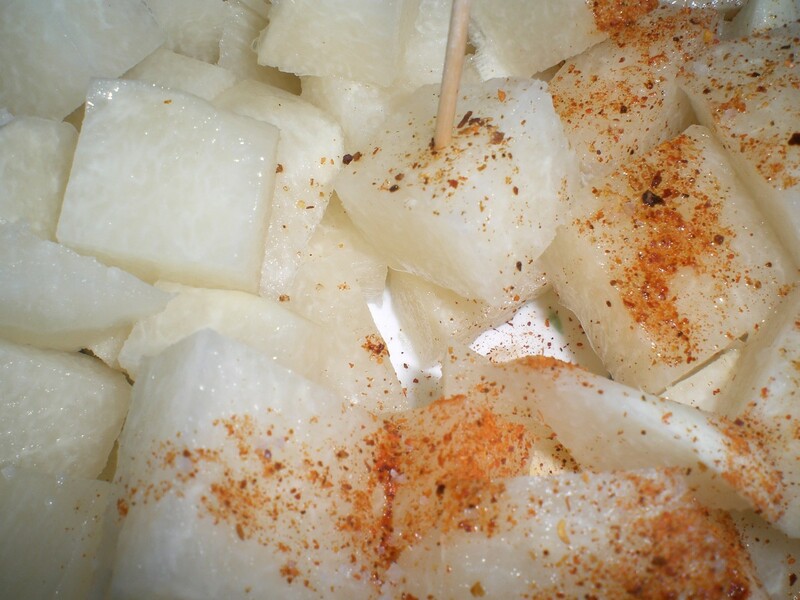 Serve fideo in soup or chili bowls. Enjoy! Fideo is a pasta, a macaroni product. According to Wikipedia, fideo originated in Spain. Add a sprig of cilantro to the bouillon mixture for added flavor. Add a dash of ground cumin. Dontei, thank you so much. carol7777, thank you so much, that is a great compliment. 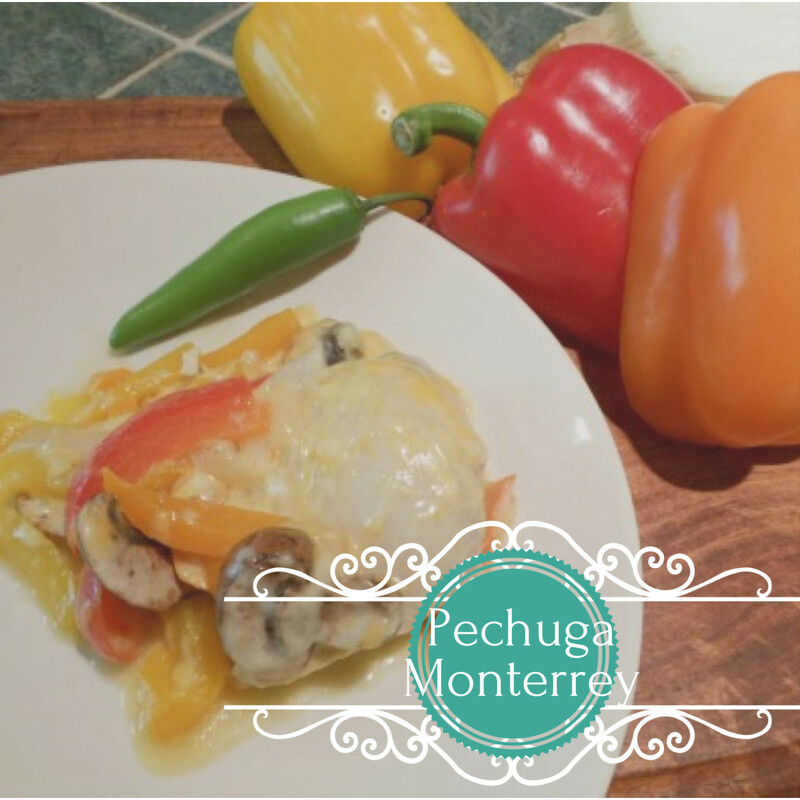 another delish recipe. I think Iwill have to start a file with your recipes. they all look so good. Sharyn's Slant, Hi Sharon! Yay! I love to hear that! I'm sure your dad would be happy with you ANY day. You are just wonderful. 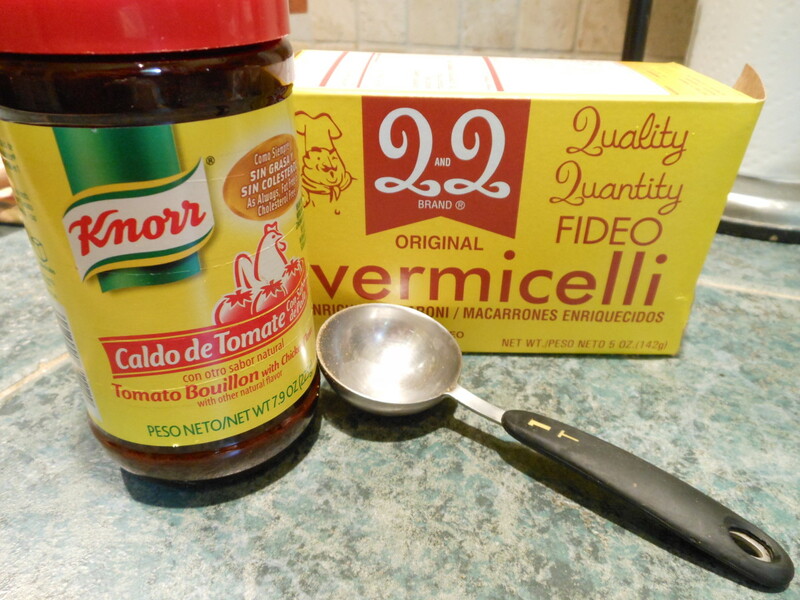 Fideo/vermicelli is a great way to stretch a meal and add flavor and variation. I do hope you enjoy it! Thank you so much for reading and commenting. Love ya! Well Miss Olive, I have learned a LOT from your most recent recipe hubs and I love them all. My father is going to be very happy with me (since I do most of his cooking). 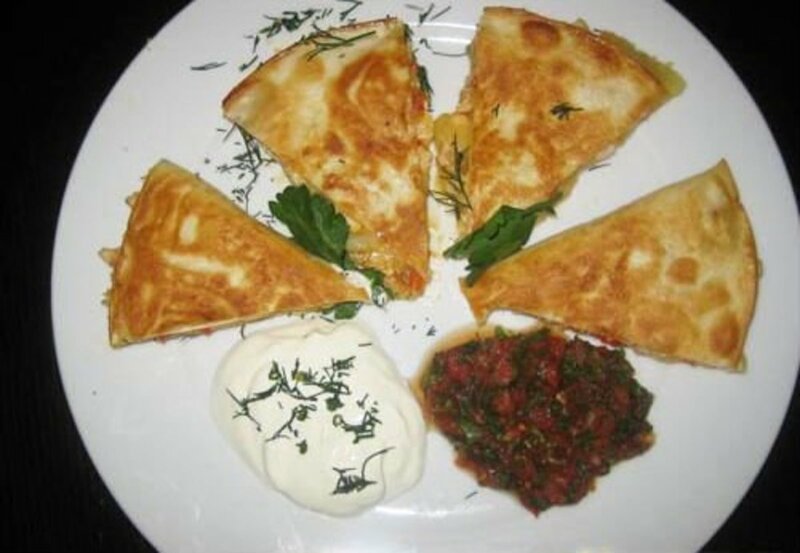 Thank you for these great recipes. Toombs08, thank you! I'm with you on the rotation. Sometimes we need to just lay off the beef. Chicken is always good and I do hope you like it with the vermicelli. Thanks for stopping by and thanks for the VUMS! teaches12345, yes, tomato and cumin have a distinct flavor and are common in fideo and mexican rice, but I don't have to tell you that. :) I'm glad to have stirred up some warm and tasty memories. I do hope you get too enjoy some fideo in the near future. Gypsey Rose Lee, Thank you so much! sgbrown, I'll be sure to check out your blog - sounds wonderful! Thank you for sharing and I do hope you enjoy some vermicelli soon. This sounds soooo good! I haven't had vermicelli in years, sinced I moved from El Paso, Texas. I am definitely going to have to try this! 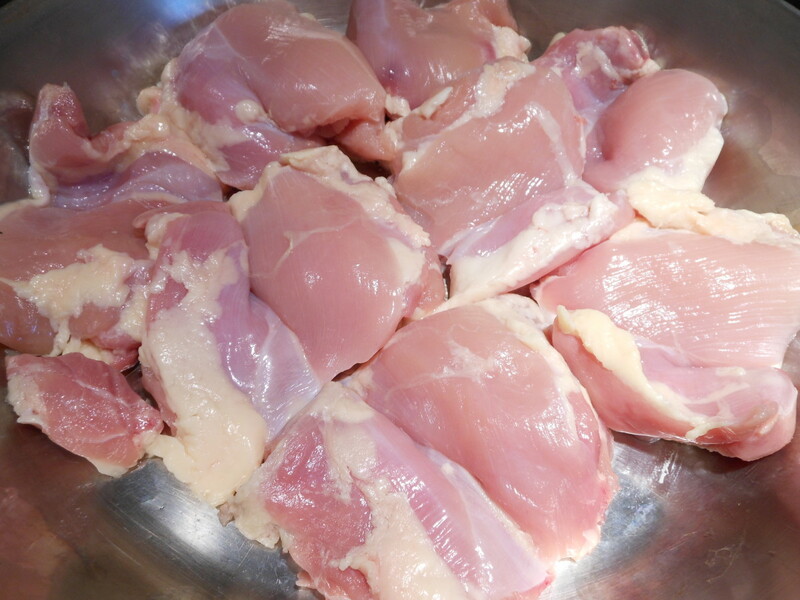 I think using the chickent thighs will work wonderfully! 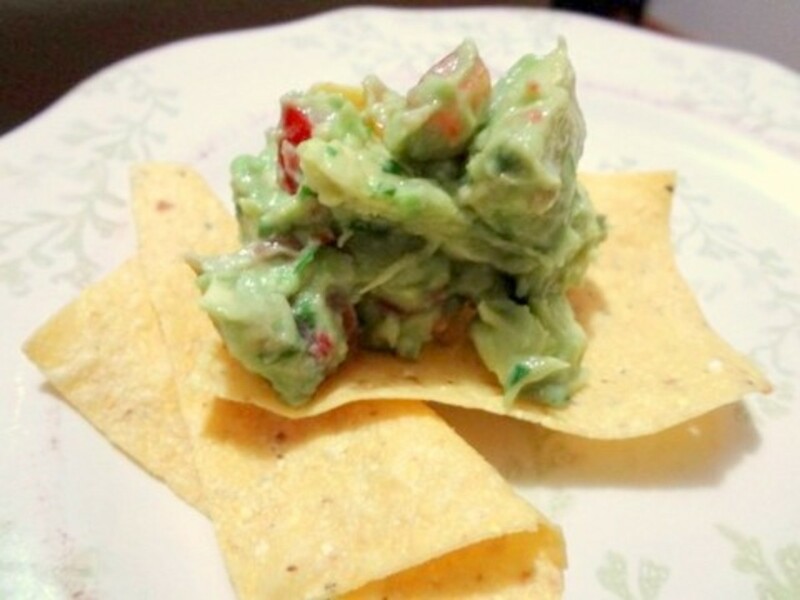 Voted this up, useful and would like to share on my recipe blog. Let me know if that would be ok with you. If you want to check out my blog it is Around the World with Receipes on blogspot. (Not supposed to leave links here.) Have a wonderful day! 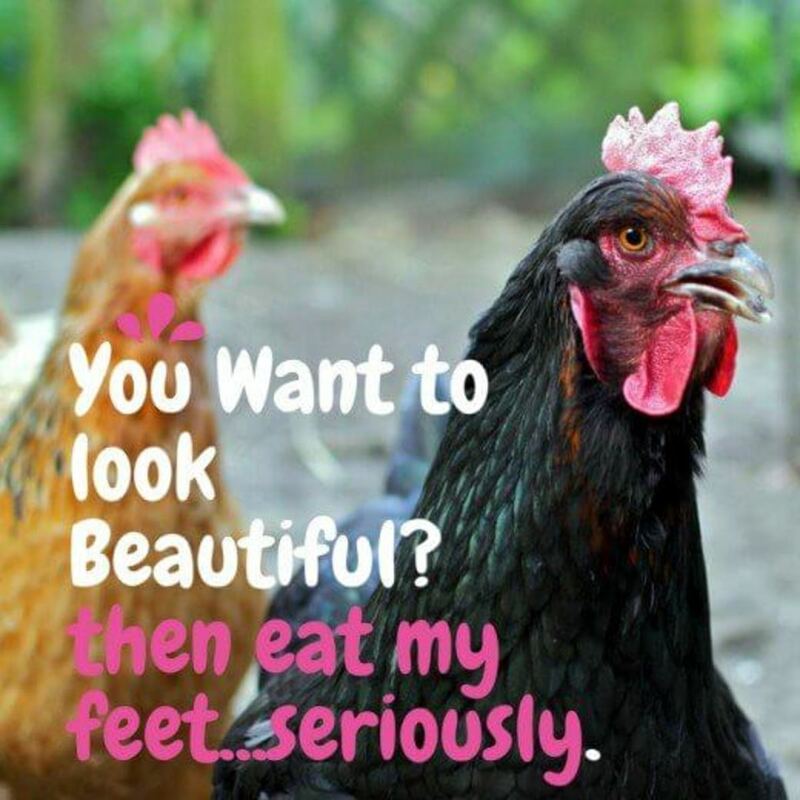 Love chicken. Thanks for this wonderful recipe. Passing it on. I haven't had fideo in quite awhile. My mom made this dish once a week when I was growing up at home. It has a great flavor when mixed with tomato and cumin. I may have to make some very soon. I love vermicelli and I'm always looking for new ways to use it. This looks SO easy and yummy. Might just have to add this to the meal rotation. Thank you, MissOlive, you are awesome, but then, you knew that! :) VUMS!